Passengers in Hampshire will soon benefit from a better and more reliable railway as Network Rail prepares to carry out a major track renewal project at Fareham. The investment will see Network Rail’s engineers replace nine sets of points, the crossings which allow trains to move between lines, as well as 240 metres of track, from 22 to 31 October. 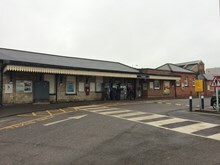 In addition, Network Rail and Hampshire County Council will be using this opportunity to jointly invest £1 million in upgrading Fareham station. This package of investment will see upgrades to a number of areas, including a resurfaced forecourt, improved station access, a new accessible toilet on the island platform, and upgrades to the existing island platform toilets. In order to carry out the upgrade safely and efficiently, the line through Fareham will need to close for nine days from 22 October with lines re-opening for passengers on 31 October. During this time a bus replacement service will operate and passengers are advised to check before they travel. Colum Cavanagh, director of route asset management at Network Rail said, “The work at Fareham will deliver another slice of our Railway Upgrade Plan, providing a better railway for the growing numbers of passengers in Hampshire. The points we’re renewing are very heavily used and are at the end of their design life, so by replacing them we’ll be ensuring the long-term reliability and resilience of the railway for passengers. “Due to the scale of the work we will need to close the railway for a week, so this is a case of some short-term disruption which will result in longer-term benefits and I’d like to remind passengers to check before they travel. The new track at Fareham will last for decades, and the upgrades to the station itself will make it a more inviting place to be.